How did they get there? Nara and DezRay worked closely with Goodwill’s Employment Services, a team that finds opportunities and employment matches based on job openings and individual skill sets. Lisa N., a Job Developer at Goodwill, worked with both Nara and DezRay to help them obtain and maintain competitive community employment. Nara had limited employment experience, as she only worked a few hours, one day per week at a Farmers Market. DezRay had been in and out of Goodwill’s Employment Services program since 2012. She completed Culinary Training in 2015 and came back for Placement Services two years later. Lisa had built a solid business relationship with Jamie J. the Manager of the Dietary Department at WellSpring, and she realized that both Nara and DezRay had the skills Wellspring was looking for. 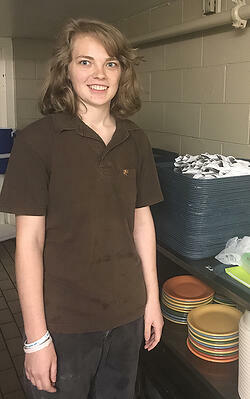 Working with Jamie, Lisa scheduled an interview for Nara for a Dietary Aide position. 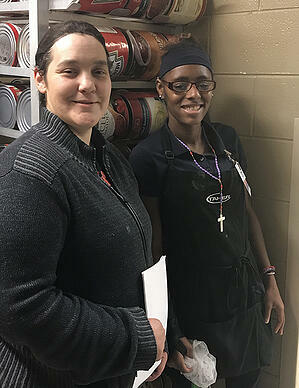 Nara was then offered an opportunity to job shadow so she could see the job “in action” and determine how comfortable she would be in the position. Nara has some communication challenges and at times would become stressed and would have difficulty communicating her feelings. Jamie understood this and worked with the Lisa and Nara to support Nara in this role. She was hired as a Dietary Aide in November 2016 and is doing a great job. Nara enjoys her success; she is now talking up a storm and has really come out of her shell, laughing and joking with coworkers. Because of the relationship Lisa built with Jamie at Wellspring and how well staff helped Nara adjust and succeed, it was thought DezRay would have the same positive experience.